Association of methylentetraydrofolate reductase (MTHFR) 677 C>T gene polymorphism and homocysteine levels in psoriasis vulgaris patients from Malaysia: A case-control study. CTLA-4 gene polymorphisms and natural soluble CTLA-4 protein in psoriasis vulgaris. 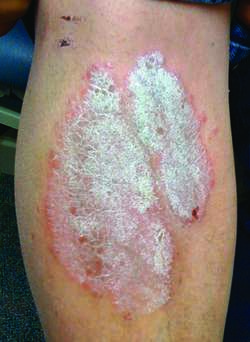 It was developed to treat patients with psoriasis vulgaris - the most common clinical form of psoriasis. Association of TNF -238 and -308 promoter polymorphisms with psoriasis vulgaris and psoriatic arthritis but not with pustulosis palmoplantaris. Evaluation of a multicentre study of synchronous application of narrowband ultraviolet B phototherapy (TL-01) and bathing in Dead Sea salt solution for psoriasis vulgaris. Psoriasis vulgaris olgularina ait tedavi oncesi ve tedavi sonrasina ait deri biyopsilerinde IFN-[gamma], TNF-[alpha], IL-23, IL-17 ve OPN ekpresyonunu belirlemek icin streptavidin-biyotin uclu indirekt immunperoksidaz yontemi kullanilarak boyama yapildi. A new calcipotriol/ betamethasone dipropionate formulation (Daivobet) is an effective once-daily treatment for psoriasis vulgaris. There are two forms of psoriasis, classical or psoriasis vulgaris and pustular psoriasis. 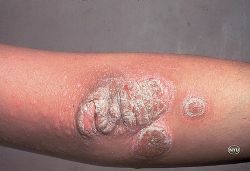 13) All forms of psoriasis are associated with arthritis, but classic psoriasis vulgaris is seen most frequently. 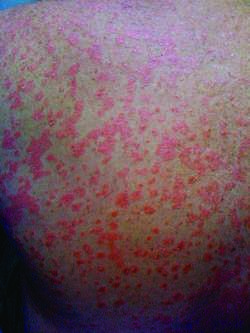 Bullous pemphigoid may be associated with other autoimmune diseases such as diabetes, pernicious anemia, rheumatoid arthritis, multiple sclerosis and chronic inflammatory diseases such as lichen planus, psoriasis vulgaris as well as some malignancies and drug use. Psoriasis vulgaris is a chronic, relapsing, immune-mediated, potentially devastating disease, influenced by genetic and environmental factors, that can cause substantial morbidity and psychological stress and have a profound negative impact on patient quality of life.